Good with everything. Free from allergens, artificial colourings, flavourings and sweeteners. Vegetarian Society approved and accredited by the Coeliac Society. Harnessing the naturally sweet flavours of beetroot and apple, The Foraging Fox Original Beetroot Ketchup is a wholesome and tasty twist on a traditional favourite: 100% Natural, Yeast and Gluten free, Nothing artificial, Tomato free, suitable for vegans and vegetarians. Borne from the ethos that you don't waste good food, you just get creative with it, the recipe was honed over a 3 year period by one of the company's co-founders, Frankie Fox. Full of flavour with fewer ingredients. Naturally good with everything & better for everyone. Shake well before use. Here are some teasers on how you might enjoy using our Beetroot Ketchup over the Spring and Summer months! Brunch / Lunch The Foraging Fox Original Beetroot Ketchup is the perfect addition to any burger or hot dog and is sensational with sausages! We also use it as a marinade for fish or chicken. Add it to some good quality Olive Oil and drizzle it over salads - we love it with a goats cheese, walnut and rocket salad! Try it as a new addition to your Picnic basket - it's great with quiches and sausage rolls and scotch eggs. If you're feeling peckish, try it as a dip with griddled Halloumi cheese or sweet potato fries! 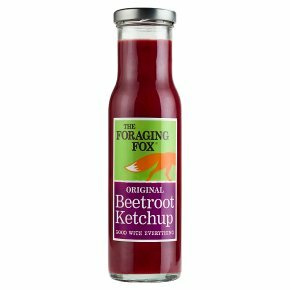 Dinner Use the Foraging Fox Original Beetroot Ketchup as a marinade for Chicken or fish ... we especially like it with baked salmon. Mix it with Crème Fraiche and create your own take on a Marie Rose sauce .... Create the perfect lamb burger - It's simply delicious with our Beetroot Ketchup!